California, We’ve Arrived… And We Brought Dark Roast! That’s right Californians! After much anticipation and the support of our west coast fans, we’ve finally set up shop in the Golden State with our first two full expression California restaurants. We opened our first restaurant in Modesto last week and today we’re celebrating the grand opening of our first Los Angeles restaurant in Santa Monica in a very bold, yet smooth, way – debuting our new Dark Roast coffee. 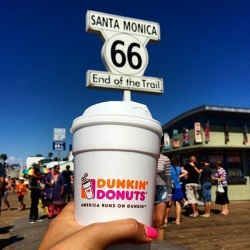 At today’s grand opening, we’ll be rolling out the pink carpet and treating our loyal California guests by surprising them with Dunkin’ swag, a sampling of our popular menu items and photo opportunities with our famous mascot, Cuppy! We’ll also have a special ribbon cutting event with appearances from Mayor Pam O'Connor and a check presentation to Los Angeles Regional Food Bank. 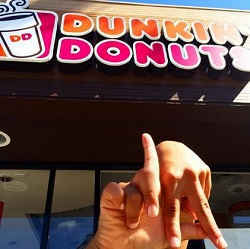 Get live updates on the grand opening by following @DunkinLA. We’ll also be unveiling our new Rainforest Alliance Certified™ Dark Roast Coffee for the very first time. Like our expansion to California, Dark Roast is another meaningful development, as it’s our first major coffee innovation since our espresso beverages. Our Coffee Excellence Team didn’t take this lightly (no pun intended) and they took several years to master a blend which offers our guests a bold taste with a smooth finish, without the bitter or burnt taste typically associate with darker roasts. While Dark Roast Coffee is available in our two new California stores today, it will be available nationwide starting September 22. Our Dark Roast Coffee can be enjoyed both as hot and iced beverages, and will be available for sale for brewing at home in both packaged coffee and in K-Cup® packs, for use with Keurig® Brewing systems. At our California store opening or eager for our Dark Roast Coffee? Share the excitement with us on Twitter and Facebook!